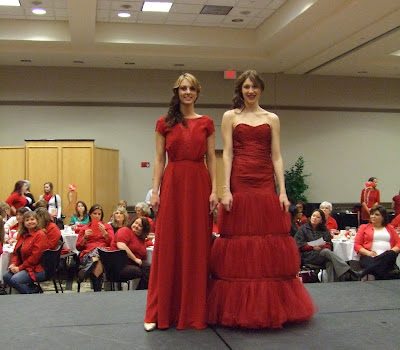 Congratulations to Gordon Steinecke and Kaitlin Scott for the designs being recognized at the Go Red Style Show on February 10th. Senior student Gordon Steinecke received First Place of Judge's Award. Junior student Kaitlin Scott won Second Place of People's Choice Award. UNT Fashion Design students presented nineteen designs on the runway; designers were Arielle Antwine, Thaddeus Brown, Christine Bullard, Kelse Clements, Jennifer Cottrell, Keyla Garrido, Emily Hutto, Brittnee Lavender, Lauren Perdue, Kim Pham, Blair Reyes, Kaitlin Scott, Gordon Steinecke, Megan Surber, Rosemary Susat, Johanna Verngren, Lizzy Villere, Reagan Whitaker, and Jamie Wilcox. Job well done for all the participants; special thanks to volunteer dressers and model: Brittnee, Johanna, Kim, Lizzy, and Rosemary (photo by Anny Chang).